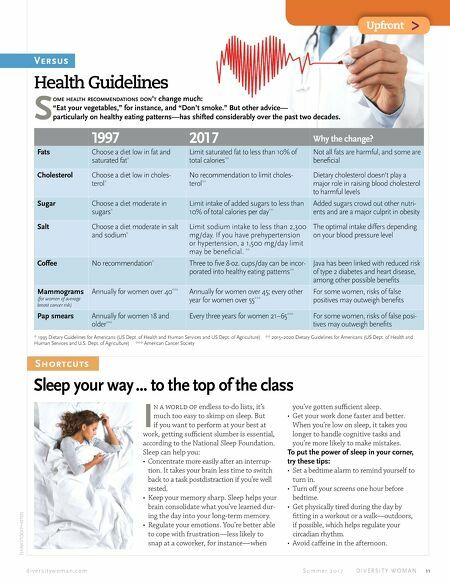 Upfront > 10 D I V E R S I T Y W O M A N S u m m e r 2 0 1 7 d i v e r s i t y w o m a n . c o m THINKSTOCKPHOTOS T he spa industry is booming—and pamper- ing experts have invented fresh ways to help you recharge. The trend is toward treatments that connect spa-goers with nature and provide a respite from the digital world. Expect to see these popular new offerings. Low tech, high touch. A digital detox option, this therapy—featured at the Omni Bedford Springs Resort in Bedford, Pennsylvania—com- bines a salt exfoliation with a hand-and-wrist but- ter massage, to ease the toll of texting and typing. The Spa at Mohonk Mountain House in New Paltz, New York, has a tension-taming massage, with extra attention to hands and forearms. Forest healing. This Japanese treatment, now offered at spas like Blackberry Farm in Walland, Tennessee, is basically a walk (or yoga or medita- tion) in a beautiful natural setting. The emphasis is on absorbing the tranquility of the environment to reduce stress and elevate mood. Mindful massage. At L'Apothecary spa at L'Auberge de Sedona, you can get a Quiet Mind massage, in which the therapist teaches you simple guided breathing techniques to help you let go of distracting thoughts. Garden revitalization. More spas are offering therapies outdoors. At the Dorado Beach Spa at the Ritz-Carlton in Dorado, Puerto Rico, guests can experience a coffee-and-cloves revitalizing scrub in the resort's lush private garden. Silent treatments. Nearly any spa treatment can be more soothing in silence. Mandarin Ori- ental spas have Silent Nights, with massages, facials, wraps, and other therapies provided in a chat-free, music-free environment. Dear DW, I've switched from a full-time on-site schedule to three days a week at home, two in the office. How do I stay produc- tive, stay connected—and make sure my colleagues don't resent me? Signed, Free but Uneasy Dear Free but Uneasy, ose are all important goals, and can be tricky to accomplish when you work at home. To stay productive, it helps to build some structure into your days. Establish defined start and end times for your workday, and stick to them. (Use a timer to remind yourself, if need be.) at will help you stay focused during the hours you're work- ing. Getting dressed in a reasonably professional outfit—a sweater, not a sweatshirt, jeans rather than yoga pants—will cue you toward work, too. Beyond that, be aware of what trig- gers you to go off track and have strat- egies to counteract those triggers. 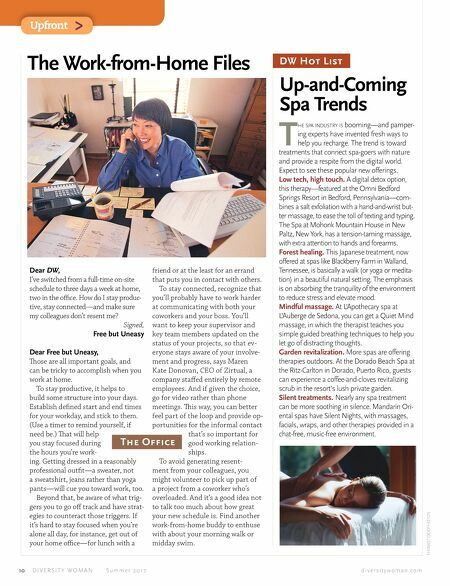 If it's hard to stay focused when you're alone all day, for instance, get out of your home office—for lunch with a Up-and-Coming Spa Trends DW Hot List The Work-from-Home Files The Office friend or at the least for an errand that puts you in contact with others. To stay connected, recognize that you'll probably have to work harder at communicating with both your coworkers and your boss. You'll want to keep your supervisor and key team members updated on the status of your projects, so that ev- eryone stays aware of your involve- ment and progress, says Maren Kate Donovan, CEO of Zirtual, a company staffed entirely by remote employees. And if given the choice, go for video rather than phone meetings. is way, you can better feel part of the loop and provide op- portunities for the informal contact that's so important for good working relation- ships. To avoid generating resent- ment from your colleagues, you might volunteer to pick up part of a project from a coworker who's overloaded. And it's a good idea not to talk too much about how great your new schedule is. Find another work-from-home buddy to enthuse with about your morning walk or midday swim.